Our research projects are studying the origins and diversity in several polyploid crops: banana, wheats, Brassica, Panicum millets, Nicotiana and the saffron crocus, Crocus sativus. The spice saffron is the stigmas of the flowers, and widely appreciated in Indian and Mediterranean cooking. 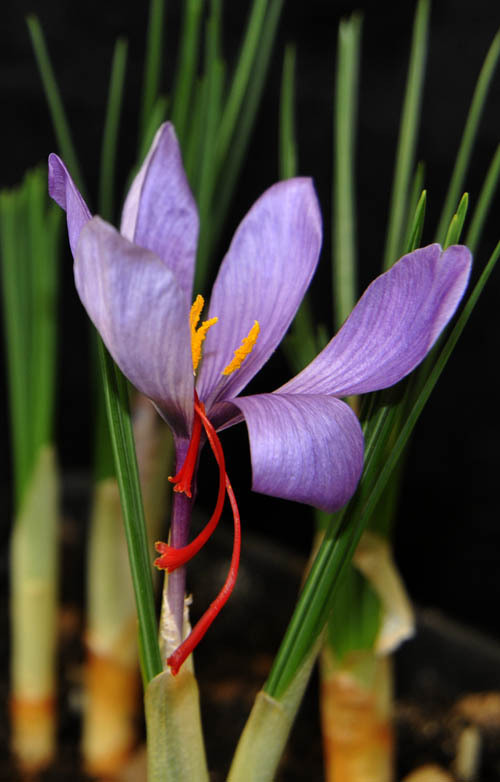 Saffron crocus is a sterile triploid, with 2n=3x=24 chromosomes – that is, 3 sets of eight. Unlike another cultivated triploid crocus ‘Golden Yellow’ that is widespread in gardens in the spring, the ancestors of saffron are not clear. Within a framework from the Crocusbank EU project and now the ESF Saffronomics project, Nauf Alsayaid and Farah Badakshi have been looking at the relationships, sequences and chromosomes of saffron and wild Crocus species, using a range of molecular and cytogenetic methods. Emanuele Ranieri from the University of Perugia, Italy, joined the project as an Erasmus student and has been working on some of the sequences; he is now completing his thesis. Happily, Emanuele’s thesis solves the mystery of the origin of saffron: Krokus (Κρόκος) was a beautiful Arkadian young boy in love with the nymph Smilax but Hera, out of jealousy, turned him into a flower and Smilax was turned by the god into bindweed. While the molecular DNA sequence data is not conclusive, I think that it rules out the alternative explanation that Krokus was a companion of Hermes and was accidentally killed by the god during game of discus. Hermes was so remorseful by his death that he transformed Krokus’ body into a flower. I wonder if our final papers from project will agree with the explanation based on Hera’s transformation? Correction: Whoops – proofing error has C. versus not C. sativus. This entry was posted in PhD students, Research and tagged crocus, crops, domestication, flowers, polyploidy, saffron, stigma. Bookmark the permalink.